This is a quick and easy way to save your children's when trousers or add a nice decorative flair when the knees get worn out. You don’t have to be a crochet guru to make these. 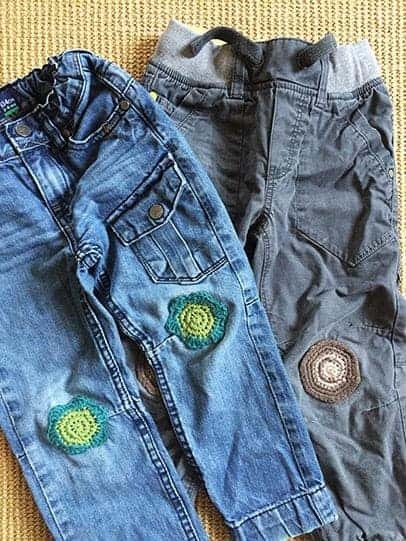 It’s a quick and cheap way how to fix some holes or add original decoration to the child’s clothes. This project of mine is not related to the kitchen or cooking. It’s actually about my son’s trousers. I don’t know why I feel like I should be writing only about all things related to our kitchen. Possibly because of the blog’s name though. However, it is kind of related to our kitchen. This whole project took me 40 min, all done in our kitchen. See, there is always some connection here. My 4-year-old son had two pairs of trousers in his draw with worn knees but the trousers weren’t outgrown yet. Such a shame as the trousers were otherwise in reasonable condition and he could still wear them on those messy days. that my son would certainly love. But come on, I am talking about worn trousers. There must be an easier way how to patch the trousers without spending any money. I’ve been currently working on a crochet cushion cover for our dining room so I thought, why not to try some side project and make crochet knee patches for my son’s trousers. I made flower shape knee patches for one pair and simply saw them onto the trousers to cover the worn areas. It was so easy. It required basic crochet skills, some leftover cotton yarn, a crochet hook, a needle, thread and 40 minutes of my time. I am happy with the result. The trousers have still some life left in them. The crochet knee patches even gave my son a bit of padding for his knees. 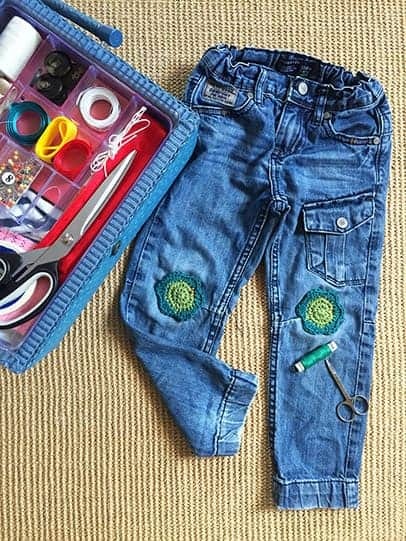 It’s a quick and cheap way how to fix some holes or add original decoration to the child’s clothes. Would you like to dye eggs naturally with turmeric, tea, red cabbage and onion skin? Read my instructions below and you’ll be pleasantly surprised with the result.